SBI SME(Banking) Posts Recruitment 2017, State Bank of India 554 SME Posts Recruitment 2017 Notification,SBI SME Posts Recruitment 2017, State Bank of India has announced the Special Management Executive (Banking) 2017 Notification. The SBI is looking for the experienced bankers with the PG degree qualification. The SBI Recruitment 2017 Notification has been issued for the 554 SME MMGS II, III Posts. Eligible aspirants can apply online through sbi.co.in on or before May 18, 2017. 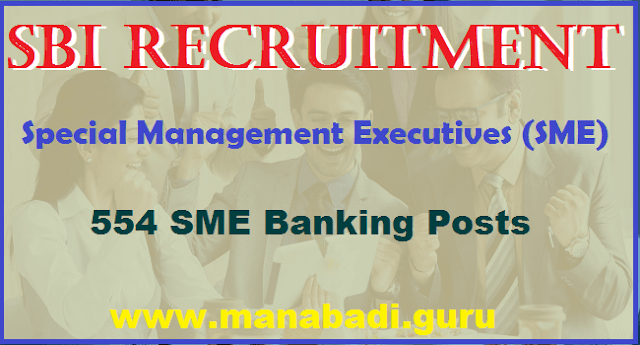 CA/ ICWA/ ACS/ MBA (Finance) or equivalent post graduation degree with minimum 5 years post qualification experience as an executive in Supervisory/ Management role for MMGS III posts, minimum 5 years post qualification experience as an executive in Supervisory/ Management role for MMGS II posts. Selection of candidates will be on the basis of online objective test, group exercise and/or interview. Online objective test is scheduled to be conducted on 18.06.2017.